NBC has officially parted ways with Megyn Kelly, the company said in a statement released Friday. “The parties have resolved their differences, and Megyn Kelly is no longer an employee of NBC,” a network representative told TheWrap. The former Fox News star, who generated negative headlines and weak ratings in 13 months hosting the third hour of the network’s “Today” morning franchise, is expected to be paid out for the remainder of her three-year contract, an individual familiar with the matter told TheWrap. That sum is believed to be between $25 million and $30 million. Under the separation agreement, Kelly is free to seek on-air work at another outlet immediately, the insider said, adding that the agreement contains a non-disclosure clause identical to the one Kelly signed when she joined the network back in early 2017. In a video interview posted on TMZ just hours before NBC’s announcement, Kelly said she “definitely” planned to return to television in 2019. A rep for Kelly did not immediately respond to request for comment from TheWrap. Almost immediately, Kelly was denounced by the NAACP and dropped by her talent agency. An emotional on-air public apology was not enough to stanch the bleeding from yet another self-inflicted PR wound. The “blackface” gaffe was one of many for “Megyn Kelly Today,” which launched in September 2017 with much fanfare. The program was beset by low ratings as the former Fox News firebrand struggled to find her softer side as a daytime TV host. Throughout her tenure, she was unable to fully separate herself from the inflammatory style that made her standout on Fox News. On-air flubs included a defense of fat shaming and asking Jane Fonda about her plastic surgery during a live interview. Neither moment went over well with her new, female-skewing daytime audience or with numerous critics on Twitter. However, Kelly did gain some traction with viewers with harder-hitting segments about the #MeToo movement, including sympathetic interviews with victims of sexual misconduct and tough grillings for lawyers representing the accused. Kelly also had short-lived primetime show that aired during the summer of 2017, which generated attention for an interview with InfoWars conspiracy theorist Alex Jones but drew unimpressive ratings numbers. Though Kelly is not bound by a non-compete clause despite leaving NBC with another year on her three-year, $69 million contract, it’s unclear where she might land next. Her former employers at Fox News have reacted coolly to the idea of Kelly returning. 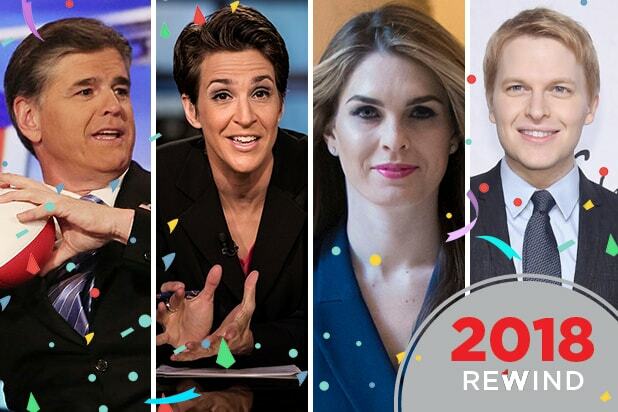 2018 was a tumultuous year for members of the media. For many, even most, it was a grim period of layoffs, consolidations and paywalls. But for others, it was a year full of triumphs. Sean Hannity: The Fox News host would have appeared on TheWrap's list of media winners simply for hosting the #1-rated cable news show on TV, but it's his unique personal relationship with President Trump, who he is known to call regularly, that made him the only choice for the top spot. Bryan Goldberg: In an otherwise ugly year for media, which was marred by layoffs and consolidations, the Bustle kingpin proved a standout success. His acquisitions of Gawker and Mic.com for bargain-basement discounts suggest plans for a burgeoning digital empire. Los Angeles Times: The iconic LA broadsheet was well on its way to the losers' column under the disastrous leadership of Tronc. The paper, however, was rescued by billionaire Patrick Soon-Shiong for a half-billion dollars. Now, in swanky new offices, the paper is expanding. Chris Cuomo: The CNN anchor had always been a standout on the network's morning show, "New Day," but he really came into his own after a move to primetime in June of this year. Cuomo is still way behind his rivals at MSNBC and Fox News, but he has injected new life into the hour, which had been moribund under its earlier host Anderson Cooper. Hope Hicks: The former White House communications director and Trump whisperer managed to leave the White House scandal-free and with her reputation intact in February. She then landed herself a plush new gig at "new" Fox where she serves as comms chief. Just 30 years old, it's a good bet you'll be hearing more of her in the years to come. The Washington Examiner: The Trump-leaning D.C. tabloid got a jolt of new energy after poaching New York Post Op-Ed editor Seth Mandel. The paper will also be expanding nationally next year, largely off the carcass of its sister publication The Weekly Standard (which will be shuttered). Ronan Farrow: Once an obscure MSNBC journalist, Ronan Farrow has rocketed to fame while reporting some of the biggest stories of the MeToo movement. His pieces for the New Yorker on Harvey Weinstein, Les Moonves and New York State Attorney General Eric Schneiderman all played a significant role in ending their careers. He nabbed a Pulitzer Prize for his efforts, and — in his spare time — managed to write a bestselling book on foreign policy. Shari Redstone: The National Amusements super-boss spent much of 2018 scheming against her rival, former CBS chief Les Moonves, and attempting to force a merger between CBS and Viacom. A MeToo scandal put Moonves away for good and now makes the merger a near certainty. Fox & Friends: President Trump watches the nation's top cable news morning show with near religious devotion. As he has since 2011, he sometimes calls in to offer lengthy monologues about world issues. Segments from the show are regularly repackaged into the president's Twitter feed and can shape news cycles for days. When hosts are upset with him, they have occasionally looked directly into the camera to tell him so. Rachel Maddow: America in the Trump era has also created a crop of #resistance heroes, with the brightest star being Rachel Maddow. The MSNBC host expounds nightly on the latest details of the Russia probe and delivers lurid speculation about how the latest scandal will be the one to take the president down. Maddow and her program have been rewarded in the ratings, making her the most significant (non-Fox) anchor in cable news by far. Megyn Kelly: Yes, she may have lost her NBC show. But the ratings had been sagging and everyone agreed it was a bad fit anyway. Now the former "Today" star is poised to walk with a roughly $30-million severance package, and if you don't think a tell-all book is coming, you haven't been paying attention.